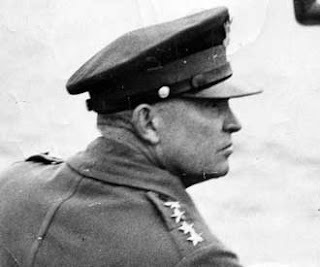 Dwight D. Eisenhower, the Supreme Allied Commander, wrote a letter to the troops had had it read to them just prior to the D-Day invasion. In the letter he invokes the blessing of God and tells the troop that the hopes and prayers of liberty-loving people everywhere rest upon them. Below is a YouTube video of Eisenhower reading it, and below that is the transcript the letter. But this is the year 1944! Much has happened since the Nazi triumphs of 1940-41. The United Nations have in­flicted upon the Germans great defeats, in open battle, man-to-man. Our air offensive has seriously reduced their strength in the air and their capacity to wage war on the ground. Our Home Fronts have given us an overwhelming superiority in weapons and munitions of war, and placed at our disposal great reserves of trained fighting men. The tide has turned! The free men of the world are marching together to Victory! I am grateful, especially this day, for these troops who so bravely stood up to fight the forces of evil brought upon the world by National Socialism (Hitler’s Nazi Germany). I have heard a lot in the news this weekend about ‘Never Again’ referring to the Holocaust and the other horrors of fascist Germany in the 30s and 40s. And I pray that such evil does never again come upon us, and I pray that the Americans and people all over the world will recognize such evil regimes and remove them from power before they get strong enough to commit such acts like that again. I hope the day never comes that the freedom-loving people have to again stand up to tyranny. But if that day does come, I hope that generation has the fortitude of character and the faith in God to do what America’s Greatest Generation accomplished. Can you imagine my father (your grandfather) fighting in that great war at the age of 17?! Now that I have children it seems unbelievable! Thanks for this post about D-Day. You may like reading Sergeant Nibley, Ph.D.: Memories of an Unlikely Screaming Eagle if you get a chance. Recently, I picked up The Black Book of Communism: Crimes, Terror, Repression and the book reminds us – lest we forget – of the 100 million people who died as a result of communism in the 20th century, whereas the Nazi war machine caused 25 million deaths. However, it is strangely ironic that we hear more about remembering the atrocities of the socialist Nazi regime whereas the crimes against humanity perpetrated by the socialist/communist regimes seem to go unnoticed. Hurrah! After all I got a web site from where I be capable of actually obtain helpful information regarding my study and knowledge. Hello, I do believe your blog may be having web browser compatibility problems. region’s history, thee Ottomans served the areaa by forcibly bringing the current feudal entities together and iin the role of a hegemon for their benefit.